Cedarville’s Abigail Sheridan tips a shot over a pair of Triad defenders during Thursday’s Ohio Heritage Conference girls high school volleyball match in Cedarville. Sheridan led the Indians hitters with 14 kills. The home crowd reacts as the Cedarville Indians win the final point in a three-set home win over Triad, Sept. 20. It was a good day to be a Cedarville High School student, Sept. 20. 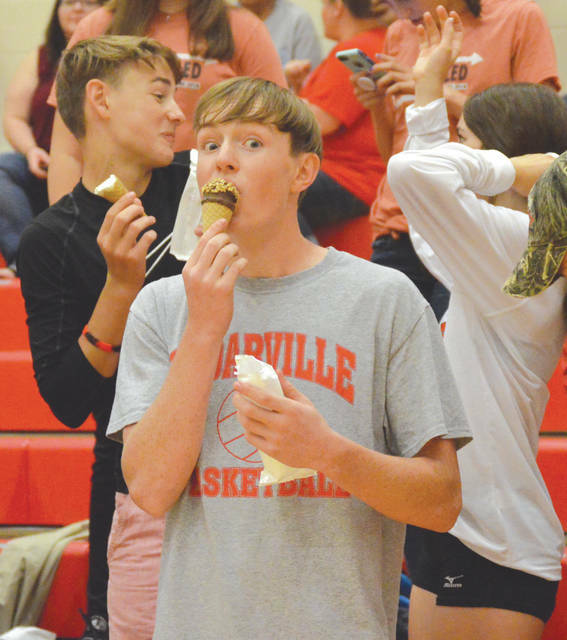 As a Homecoming week tradition, each member of the student section received ice cream whenever an Indians volleyball player served up an ace. Luisa Christian, of Cedarville, smacks a kill past the Triad Cardinals defense in Thursday’s Sept. 20 girls high school volleyball game at Cedarville High. Eva Sheridan smacks a jump serve during Thursday’s Ohio Heritage Conference girls volleyball match against visiting North Lewisburg Triad. The host Indians won the match in three sets, Sept. 20 at Cedarville High. 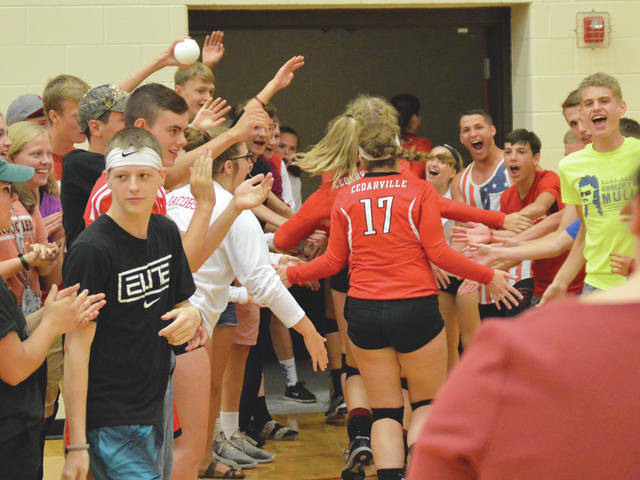 The victorious Cedarville Indians girls high school volleyball team got a rowdy reception as they headed to their locker room, Sept. 20, after the team defeated visiting Triad and won the Indians students a lot of ice cream. 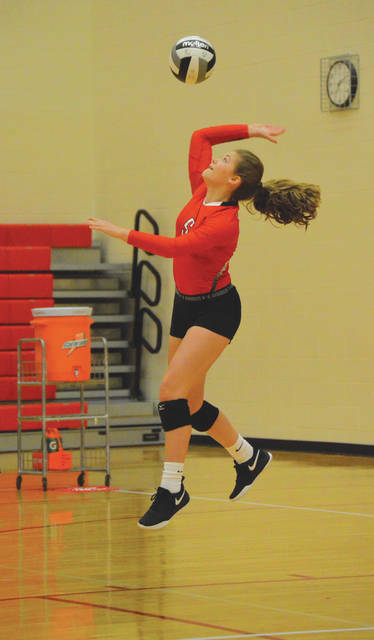 It was the first ace of Thursday’s Sept. 20 match with Ohio Heritage Conference foe Triad. It’s Homecoming Week in Cedarville. A homecoming tradition, the first Indians ace of the match during Homecoming week earns every member of the student section an ice cream cone or ice cream sandwich. Needless to say, the kids were pretty happy. 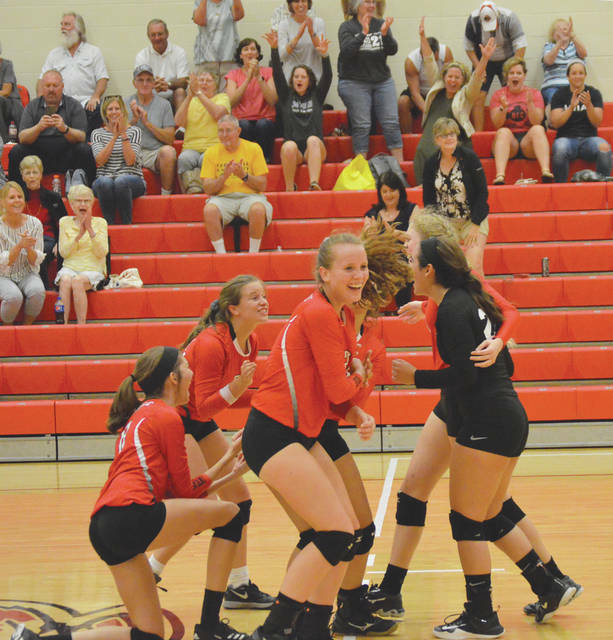 The Cedarville Indians team wound up being pretty happy as well, as they recorded their first conference win of the season in dramatic fashion, 25-23, 25-29, 31-29. Cedarville coach Bobbi Jones said her players fed off the students’ enthusiasm. 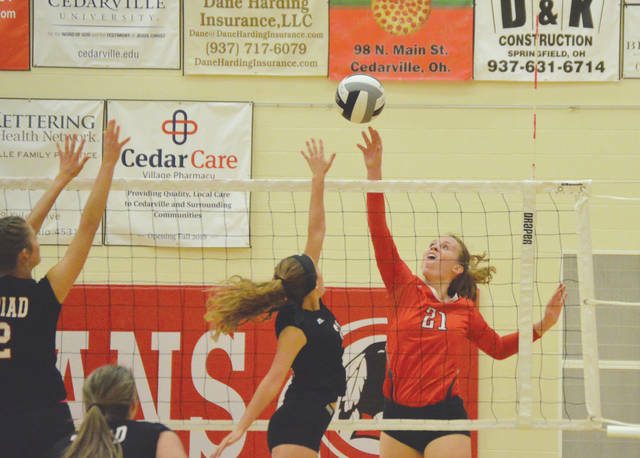 Cedarville had been mired in a slump that saw the Indians lose four straight matches without winning a set. Jones said the dramatic 25-23 come-from-behind opening set win set the tone for the rest of the match. Triad was out in front 23-22, needing just two more points to take the opening set, but served deep on the next point to even the set at 23-all. Tobias then smacked her ice cream ace to give the Indians a 24-23 lead, then a Triad hit sailed wide left to earn Cedarville the 25-23 set win. Abby Sheridan led Cedarville with a team-best 14 kills. She was also credited for six aces and eight digs. Olivia Willis recorded seven kills, while setter Elly Coe dished out 26 assists, served up one ace and had one kill to go with nine digs. Cedarville is now 3-9 overall and 1-9 in the Ohio Heritage Conference. The Indians head south for their contests, a tri-match with West Carrollton and host Wilmington starting at 9 a.m. Saturday, Sept. 22 at Wilmington High. 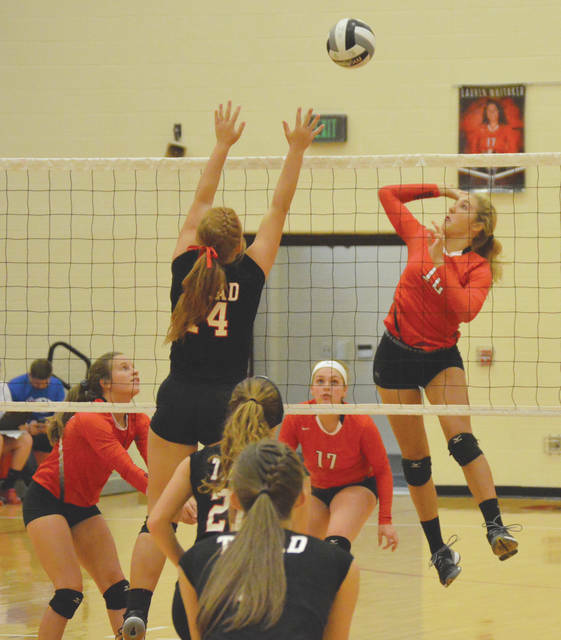 Triad falls to 0-9, 0-5 OHC and will host Southeastern in an OHC battle next, a 7 p.m. match on Tuesday, Sept. 25. With an almost one-hour drive ahead of them, coach Dayna Ober and her Cardinals left immediately after the match, but not before each player received a parting gift from the Cedarville Athletic Department…..